Low-priced rooms free Wi-Fi and a convenient location just west of Clear Lake please our guests who stay at American Motel Waseca. 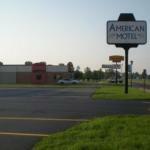 The American Motel has 51 rooms in a two-floor building with exterior corridors and no elevator. Rooms feature coffeemakers microwaves mini-fridges free Wi-Fi and cable TV. The motel serves a free continental breakfast and guests can mix and mingle in the motel's lobby. A limited front desk and free parking are also available and pets are welcome for an additional fee. The American Motel is on Highway 13 next to Waseca Community Arena just west of Clear Lake and just northeast of Loon Lake. Antiques and crafts stores abound as do fishing boating and other outdoor activities. The hotel is about a mile from U.S.-14 and 15 miles from I-35. It's also a 90-minute drive to the Twin Cities metro area Mall of America and Minneapolis-St. Paul International Airport.